QuickBooks is widely recognized as the best accounting software for small businesses. With more than 4.8 million customers around the world, the software is full-featured and easy to use. 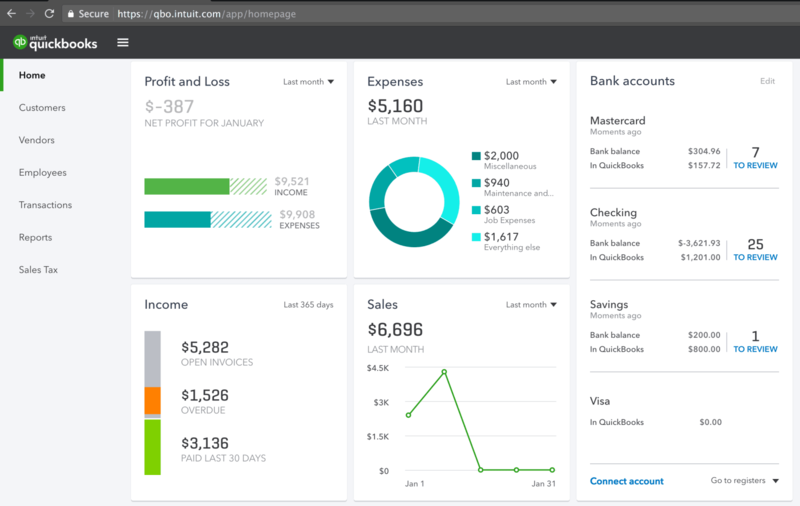 Intuit is devoting a lot of resources toward promoting and improving its QuickBooks Online product. When you visit the QuickBooks site, it primarily promotes QuickBooks Online -- you have to dig around a bit in order to find information QuickBooks Pro. Given the many benefits of cloud-based software and the growing popularity of QuickBooks Online, the Online product is going to be the most relevant option for small businesses with basic accounting needs. Therefore, this review will focus specifically on QuickBooks Online. Packages range from $5-$30/month, depending on which functionality you require. Advanced features (such as payroll) come with an additional charge. QuickBooks Online is a basic web-based accounting system that has the ability to handle more complex tasks, such as payroll and job costing, for an additional charge. The primary advantage of QuickBooks Online is that it's 100% web-based, which enables customers to access the software through any device with an Internet connection, including smartphones and tablets. The web-based system also makes it easy for users to collaborate, since multiple users can log on simultaneously. In contrast, the desktop version only lets one person modify data at one time. Doesn't my business management software handle this? The short answer is no. Your business management software is excellent at keeping track of money coming into your business, i.e how much customers pay you, and the amount reimbursed by insurance companies. However, most systems won't keep track of payroll, expenses, and purchases from vendors. This is why you need a specialized accounting system like QuickBooks, so that you can have a complete picture of your business's financial performance. The good news is that since QuickBooks is the most popular accounting system for small and medium-sized businesses, many business management systems will integrate with it, which removes the need for double entry in both systems. Below, we'll discuss some of the key features of QuickBooks Online, and how they can benefit your business. QuickBooks Online is 100% web-based, which means that it can be accessed from any device with an Internet connection, including tablets and smartphones. This is not the case with desktop systems, which can only be accessed on the computer that has the software installed (or via remote desktop software). Many users like the convenience that cloud-based software offers, which is one of the main reasons that users like QuickBooks Online, even though it is not as mature or full-featured as QuickBooks Pro. Another powerful feature is that QuickBooks Online enables multiple users to log in and make updates at the same time. This is important because it helps encourage collaboration, and ensures that each user will always have access to the most up-to-date version of your business's data. However, with multiple users logging in simultaneously, it can be difficult to track who made any changes in the system, and identify when they were made. With this concern in mind, QuickBooks Online includes an "audit log", which tracks who logged into the system, and any changes that they made during their session. However, the audit log is a bit difficult to navigate, and it can be hard to identify the exact change that each entry in the log represents. 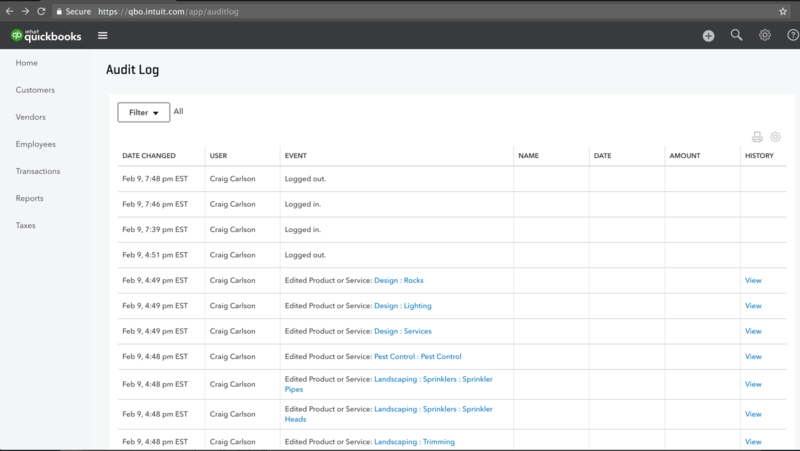 Another downside is that the audit log isn't designed to be easily searchable, so if you want to view the history for a specific item, you will have to manually browse through the entire log. This can get very time-consuming for businesses with many entries, especially if you aren't able to filter the audit log down to a particular time period. QuickBooks Online helps you email invoices to customers, who can then pay you with a credit card or bank transfer. You can also easily filter the invoices to identify the customers who have the largest open balances, and send them reminders that their payment is due. 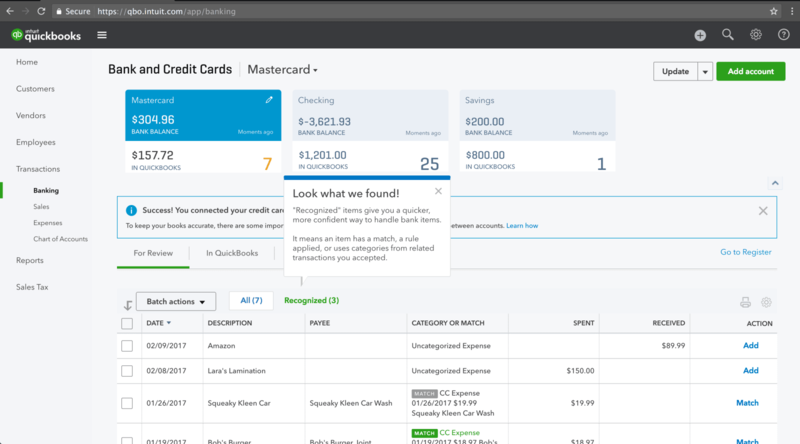 One great time-saving feature of QuickBooks Online is that you can connect the system to your bank accounts and credit cards, and have the system automatically import any transactions. This greatly reduces the need for manual data entry. However, you'll still have to make sure that transactions are categorized appropriately, and approve transactions before they get imported into the system. If any transactions are miscategorized, it's easy to correctly categorize them by using the dropdown menus. There can be a learning curve when it comes to importing your transactions and making sure that they're categorized appropriately. However, once you learn how to use this feature, you'll realize that it's one of the most powerful time-saving aspects of QuickBooks Online. Another important time-saving feature from QuickBooks Online is the ability to take pictures of receipts with your phone, and have them uploaded to the system. This makes it easy to keep track of expenses on the spot, and reduces the need for holding on to receipts for long periods of time. 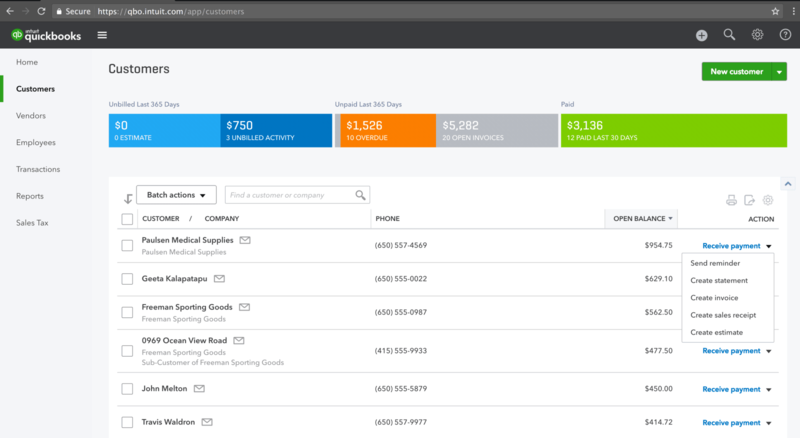 When you sign into QuickBooks Online, you'll see a quick snapshot of your company's expenses, broken down by various categories. This makes it easy to quickly assess your financial performance over the current month, as well as the previous month. QuickBooks Online also comes equipped with several reports out of box, including P&L statements and A/R Aging Summaries. You can customize these reports by adding filters and by modifying the period of time over which the report is generated, but other than that, you're somewhat limited in your customization capabilities. Many users who want to build more customized reports often export their data to Excel, and then create their reports from there. QuickBooks Online offers payroll capabilities as an add-on module, for an additional charge of $19/month and $2/employee. The payroll feature will send you payroll reminders, as well as payroll tax reminders. User feedback on the payroll module is mixed -- some say that it's easy to use once you get over the initial learning curve, and others say that they prefer to use third-party software for payroll. If your payroll is relatively simple, QuickBooks Online can get the job done, assuming you're comfortable with the additional cost. For most small and medium-sized businesses, QuickBooks Online is a top option to consider, and it's by far the most popular solution available. With over 2 million small businesses using QuickBooks Online, you can rest assured that the product has all of the functionality needed to handle your accounting needs. Especially since the product is web-based, QuickBooks Online is going to be the most suitable QuickBooks product for most small businesses. If, however, you prefer an on-premise solution, then you should consider QuickBooks Pro instead of QuickBooks Online. This product has been around longer and currently has some features that are lacking in the Online product. However, as time goes on, we expect this feature gap to continue to close, as the Online product continues to attract more users, and as more features get built out.